How cute! Who can resist these adorable Chocolate Teddy Bears! They make the perfect edible party favor. Great for Baby Showers, 1st Birthdays, Christenings, Baptisms, or for anyone that loves teddy bears. 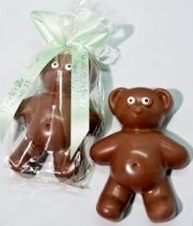 Our chocolate bears are so adorable with their eyes made of edible sugar, these Bears will be loved by all! Each teddy bear stands 4.25 and is a generous 4 oz. of our finest milk chocolate! You can choose from a personalized ribbon for an additional charge, or a non personalized ribbon free of charge. Each favor comes in cellophane and your choice of satin ribbon. Availability: Please allow 2 weeks when ordering. Rush orders are available.